Rendering of the Donate Life float that will be in the Tournament of Roses Parade on New Year’s Day. PASADENA — Anabel Mariko Stenzel, who worked with her twin sister to educate the world about organ and tissue donation, will be remembered as a hero on Donate Life America’s Tournament of Roses parade float in Pasadena on Jan. 1, 2015 for her own decision to give the gift of sight to two people after losing her battle to cancer at age 41 last year. With the support of two local organizations, Tissue Banks International and California Transplant Donor Network, a floral portrait of Stenzel will be completed by her family at an event in the Bay Area in December, then placed on the Donate Life float alongside 71 other honored organ, eye, and tissue donors. Anabel Mariko Stenzel (right) with sister Isabel Stenzel Byrnes at the 2008 Transplant Games of America. “It is a privilege for both TBI and CTDN to honor the selfless gift that Ana gave through a platform that will continue the work she started in life – encouraging others to both honor and give the gift of life,” said Gerry Seery, CEO of TBI. Diagnosed with cystic fibrosis when they were just three days old, Anabel and her twin sister, Isabel Stenzel Byrnes, each received double lung transplants at Stanford Hospital and Clinics as young adults. Anabel lived each day with determination and chose to live as if her donor were watching. 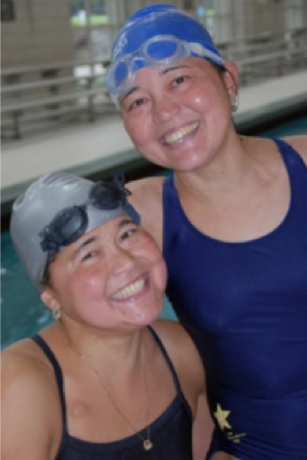 She received two college degrees, worked for 16 years as a genetic counselor at Lucile Packard Children’s Hospital in Palo Alto, and won 20 medals as a Transplant Games athlete. The sisters were featured in an internationally recognized documentary, “The Power of Two,” inspired by their memoir of the same name, and their awareness campaign, which advocated for better access to treatment and transplantation worldwide, particularly in their mother’s native country, Japan, where organ donation rates are low. On Sept. 22, 2013, Anabel lost her hard-fought battle with intestinal cancer. Having received the gift of life herself, it was very important to her and her family that she be able to give that gift to someone else. They were thankful that despite her cancer, Anabel was able to donate her corneas and restore sight to two people. “In her passing from cancer, Ana continued to show us the miracle of donation through her decision to donate her corneas,” said CTDN Chief Executive Officer Cindy Siljestrom. 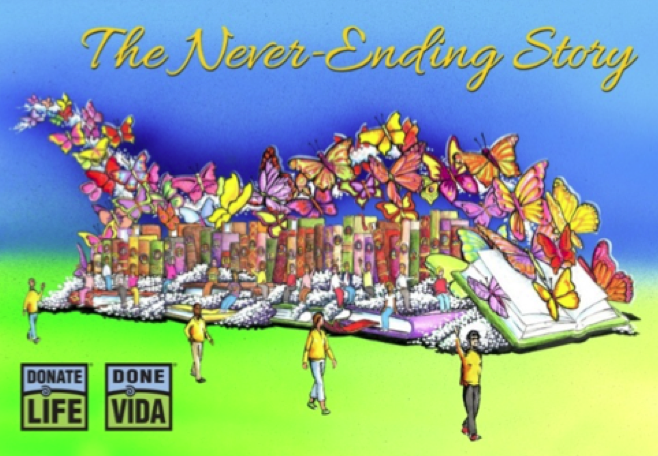 The 2015 Donate Life Rose Parade float entry features 60 butterflies – one for each life that can be transformed by a single deceased donor – emerging from an open book. The butterflies ascend above 72 volumes adorned with floragraph portraits of deceased donors whose legacies are nurtured by their loved ones. Walking alongside the float will be 12 living organ donors whose stories have become intertwined with those of their recipients. Seated among thousands of dedicated roses will be 30 riders representing transplant recipients who celebrate the new chapters of their lives made possible only by the generosity of donors. For more information, visit www.donatelifefloat.org. The California Transplant Donor Network saves and improves lives by facilitating organ and tissue donation for transplantation. CTDN helps 170 hospitals in 40 Northern and Central California and Northern Nevada counties offer the option of organ and tissue donation to families whose loved ones have died, coordinates deceased organ recovery and placement, and provides public education with the hope that every resident will become a donor. It is federally designated as the region’s organ recovery organization. For information, visit www.ctdn.org. Tissue Banks International is the only integrated, global provider of dermal, ocular, orthopedic, spine, and sports medicine biological implants to surgeons and their patients. The nonprofit has been changing lives through tissue transplantation and innovation for over 50 years. For more information, visit www.tbionline.org.